After a couple of really cold days the weather changed yesterday and the afternoon was glorious. 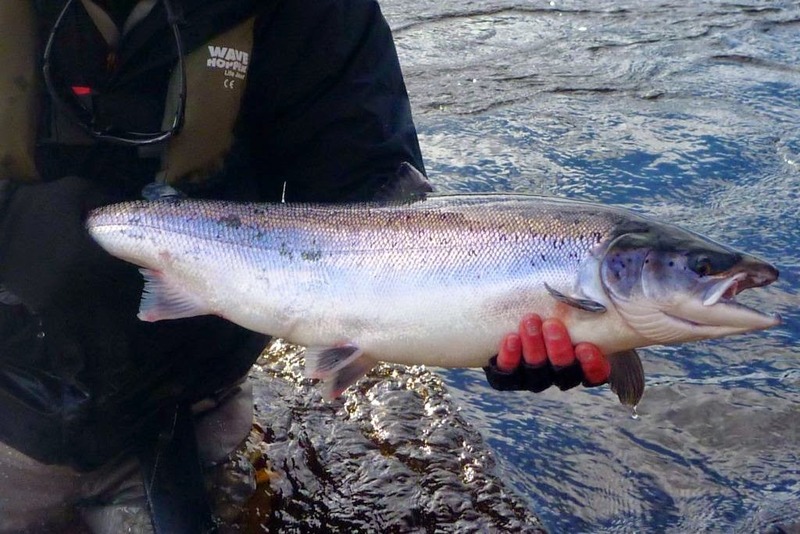 As we start to shake off the cold winter, all of the colours are beginning to come through and to see sunshine, masses of fish showing and rods up and down the beats bent into fish was to see the river at its best. We had an excellent day at Lower and finished with 99 in the book. By the time everyone had come in it was quite late so we didn’t know how close we were to the 100 mark – had we done so we would have delayed dinner! 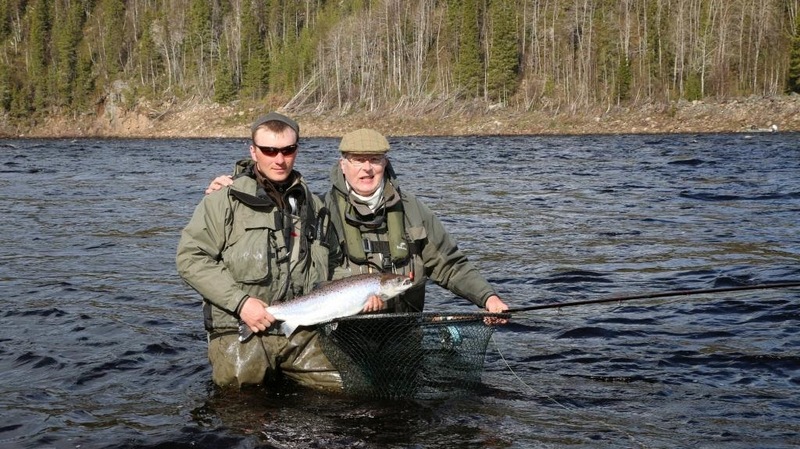 Bruce B had a fabulous day and accounted for 20 of those fish whilst Andrew W-D landed 16 to his rod. 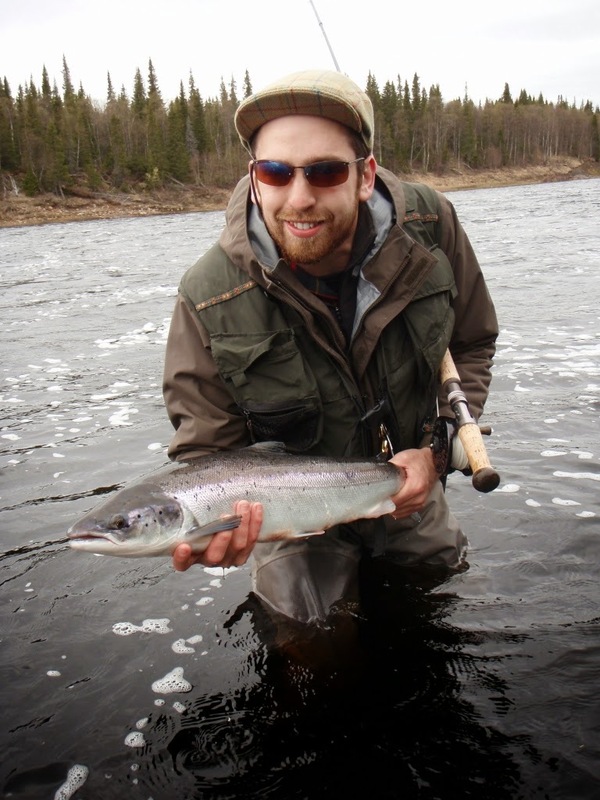 The fish are in seriously good condition and every single one is giving a good account of itself. John G was slightly losing track of how many fish he had caught and lost before his guide pointed out that his 6th fish jumped 6 times which gave him a point of reference. Morskoy Island and Beach are now starting to come into their own and we are just beginning to see the first signs of Bear Island appearing. Kitza had a strange day and they finished on 17 fish. I am not sure why that would be the case as the run was beginning to build and build so I think we just have to put it down to one of those things and hope that today is more productive. It has dropped another 6 inches overnight and their water temperature is 7c – sink tips and 1 inch copper tubes remain the favourite set up. 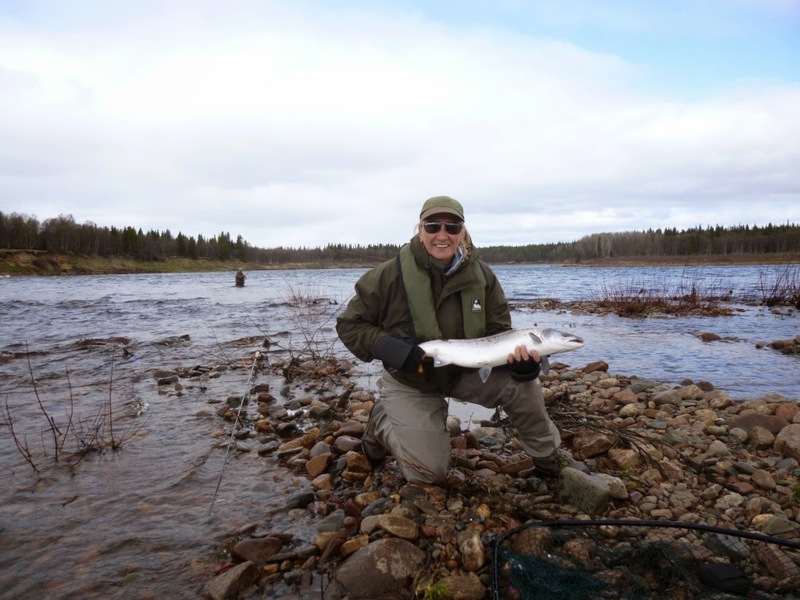 At Pana the first fish of the season was landed by Jose F. With a much warmer day yesterday and today, the water temperature will rise quite quickly which will hopefully kick start the run up there. A difficult week by anyone’s standards but on identical dates last year, this same team had a very productive week with low water and high temperatures so, as ever, predicting what is “normal” for any week can be quite tough up here. Middle continues its superb week although the bright sun did lead to the numbers dropping off a touch. We didn’t feel too sorry for them though as they still put 165 in the book with David C accounting for 19 of those – the rest were very uniformly spread across the team. East Generator and Pertiha were the most productive beats but they have still not gone much above Clarkes yet. A very bright day has dawned here but John G-H and Brendan G have already landed 6 fish between them before breakfast so we are off to a good start. We had another really cold day yesterday with the odd snow flurry and a biting wind. We all came back to camp for lunch where we enjoyed a few glasses of warmed and spiced red wine – very welcome and got the circulation going again. 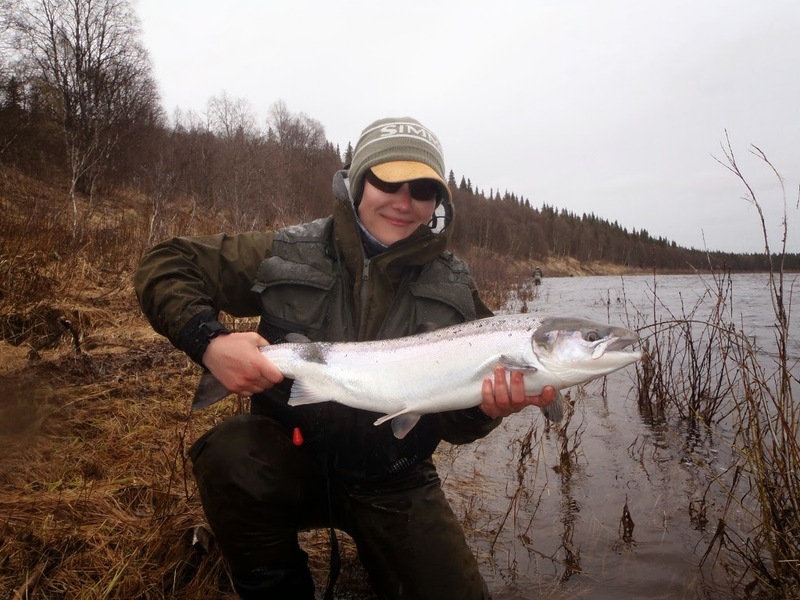 Yet again, it did nothing to dampen the fishing despite the water temperature dropping to 6c. 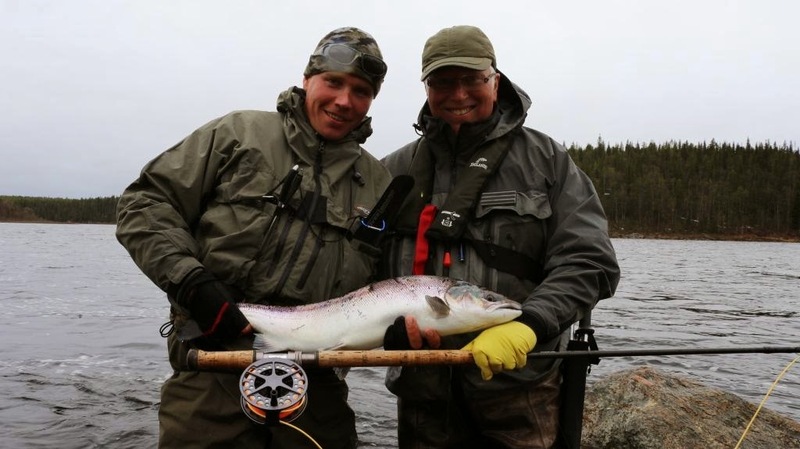 On their last day before flying to Kitza, our 10 rods at Lower landed a further 87 for the day to put their 3 day total at 242 fish – an excellent result. Mark M put his extensive knowledge of the beat to good use and was top rod with 21 but Tim J proved that he could pick up a thing or two quite quickly and landed 12. Michael G had what he described as the best days fishing of his life whilst also finishing on 12. 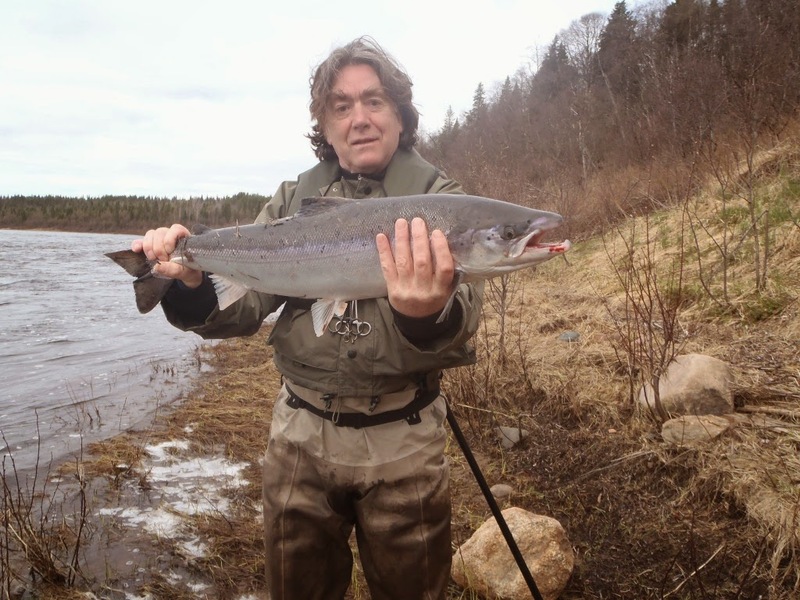 We lost an awful lot of fish yesterday as the colder water seemed to make the salmon take quite short. 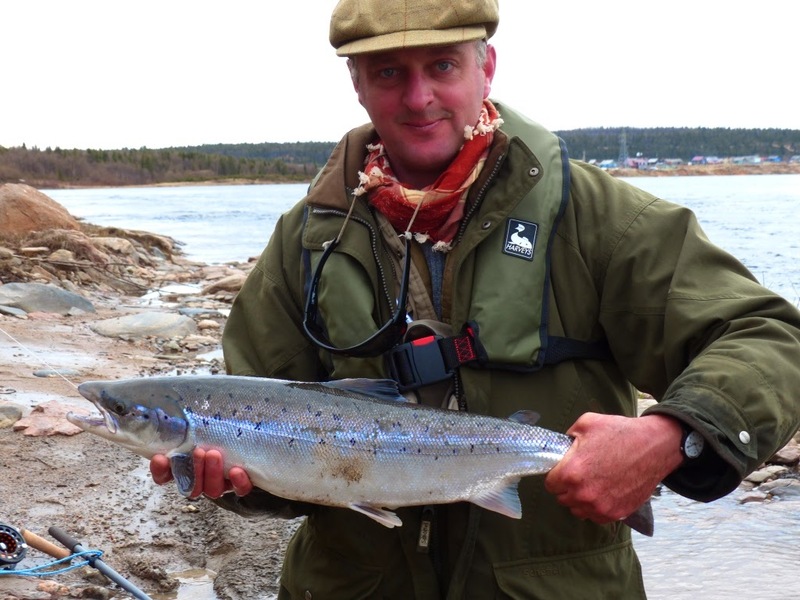 In the evening we flew over to Kitza where we met a very happy team of rods. They had added 44 to give them a half term tally of 143. 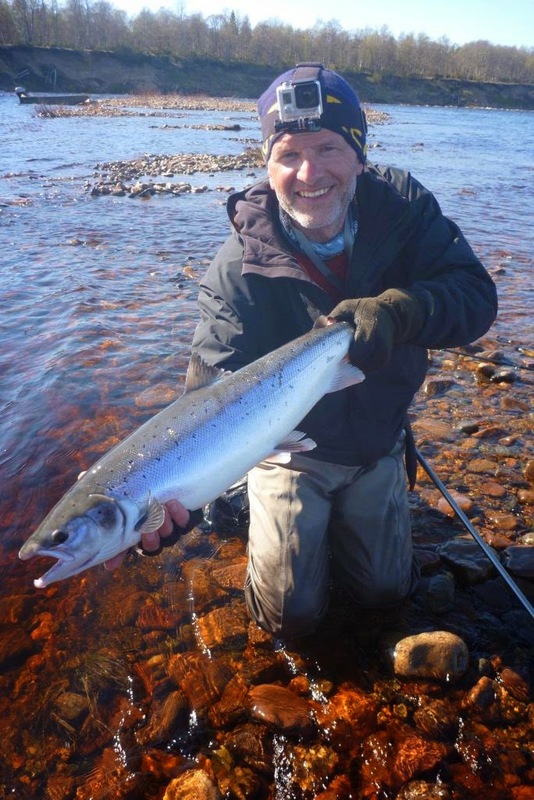 Peter H had 10 to his rod yesterday whilst Brendan G is putting in the hours and is being regularly rewarded. The river is still quite big but is dropping by about 6 inches every day and it is becoming more and more defined as time goes on. 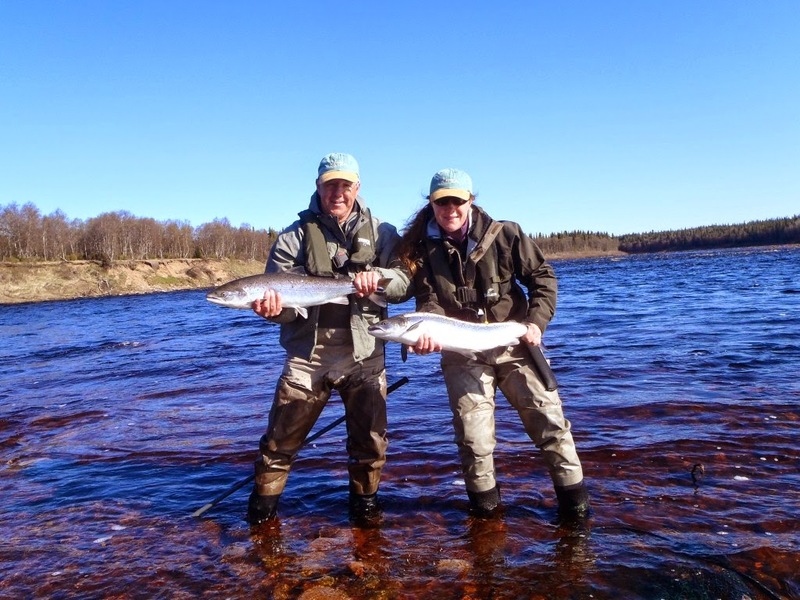 Middle Varzuga had another stellar day and landed 237 fish to the 12 rods. This puts them on a running total of 852 for the week; amazing stuff and they are on course to break their own record which they set in in 2012 which was an eye watering 1,377. David C and Chris C were the top performers in a pretty high achieving team and they each landed 31 in the day. 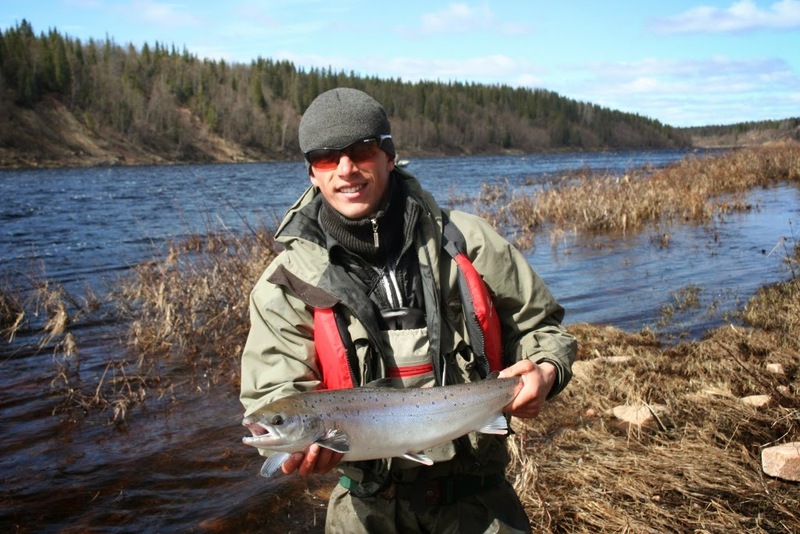 Our team at Pana are sadly not having the fishing we would hope for them. 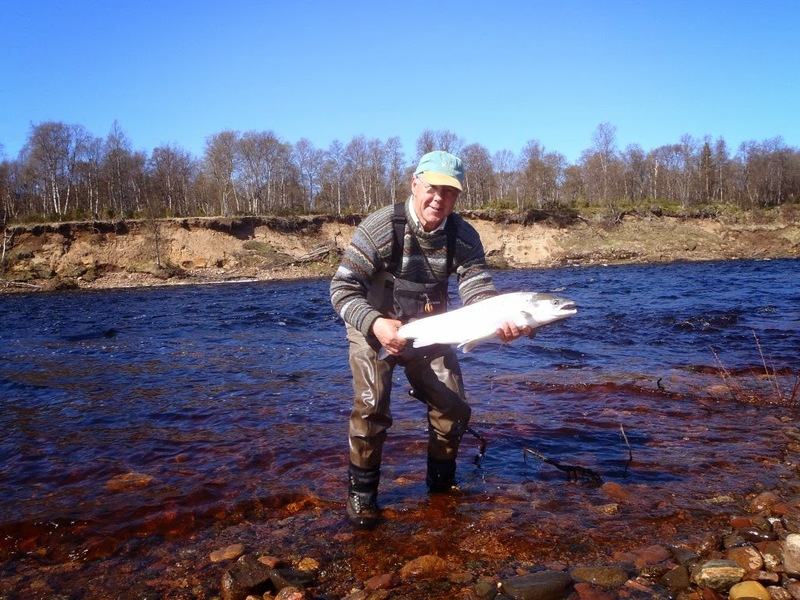 At the risk of bemoaning the weather at every turn, the combination of a late ice break, followed by a heat wave and then followed by a cold snap has ensured that the fish are moving up river quite slowly. They are boating a long way downstream to try to intercept them but so far they have had no luck. It will change and when they do hit fish they will surely hit quite a lot as the run seems very strong and they must be stacked up somewhere. I spent the morning on the coast of the White Sea with sculptor Hamish Mackie. 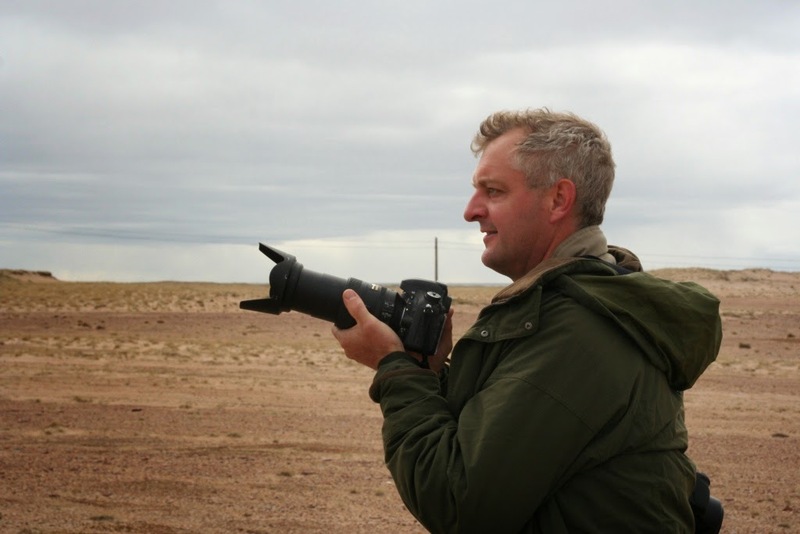 He is out here to study the Arctic Terns and the other Kola wildlife before collating an exhibition in 2016. Having taken over 1,300 photos of terns yesterday, his mind is running wild with possibilities and it will be very exciting to see what he can come up with. Yesterday was as cold a day as we have had for a while. A bitter and strong upstream wind made life uncomfortable and we had lunch in camp as opposed to our normal picnic on the riverbank. It is so helpful to have Bill Drury with us here at Lower and he got around to all of the rods to teach them new casts to deal with the strong winds. Even those who have not done it before were soon proficient in left hand up Circle C’s. 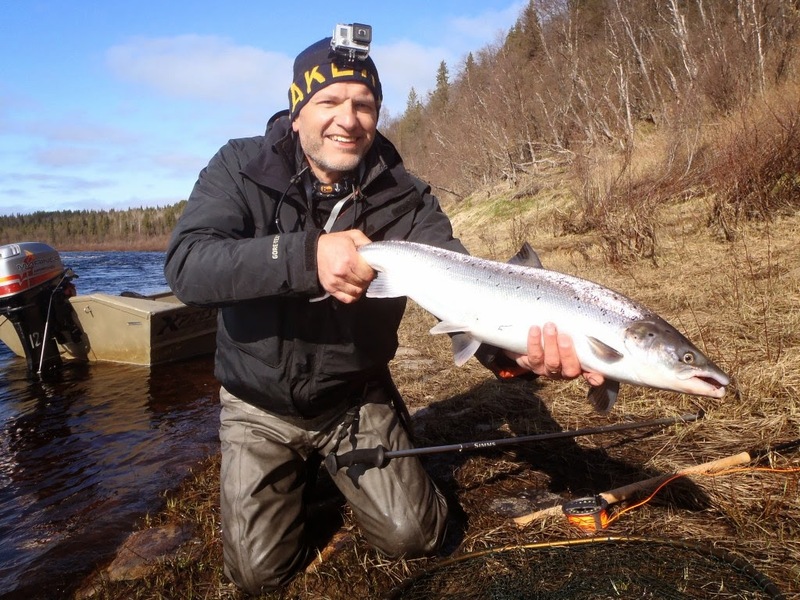 All of which would normally lead to less than productive fishing – not so yesterday. At Lower we put 106 in the book; the best day of the season and Tudor D had the day of his life landing 31 of those. Larder and Bearlets were the most productive pools for him and it was striking that he landed all of those fish in “office hours”. 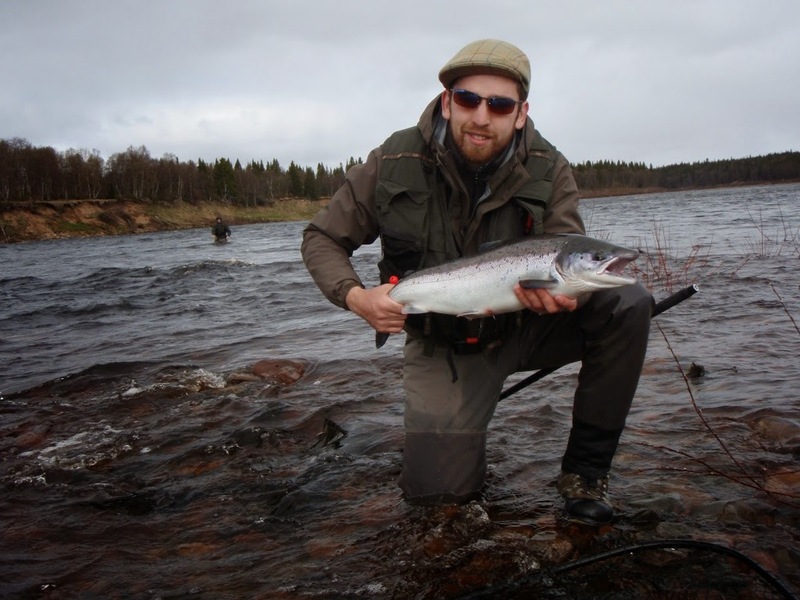 Kitza continues to improve every day and yesterday the 10 rods had 54 fish on the bank along with numerous other encounters. Brendan G is here for the first time but he put his extensive fishing knowledge to good use and had 9 for the day. In the evening I went up to Middle and it is fair to say that I walked into a pretty happy camp. They had had another amazing day and accounted for 258 between them. 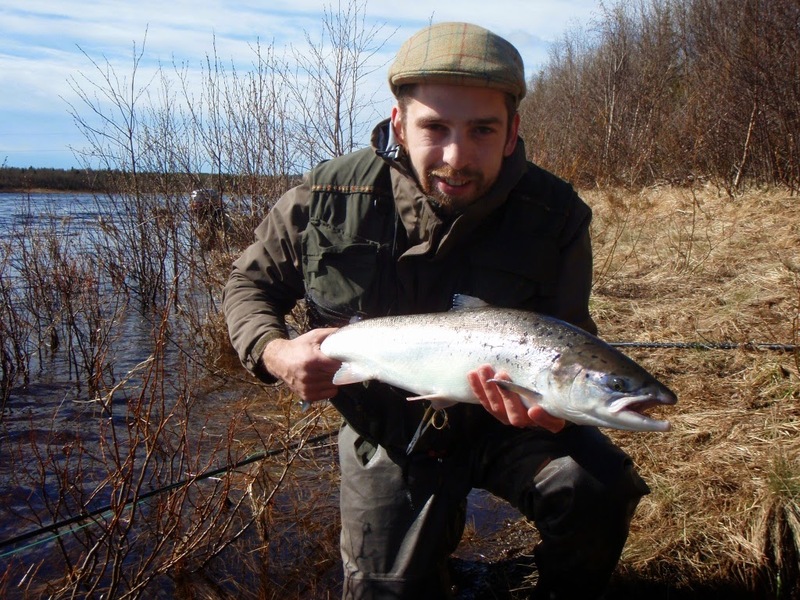 75 of those fish were taken from Pertiha pool over the day and Brian W had 30 to his rod whilst Paul C landed 26. 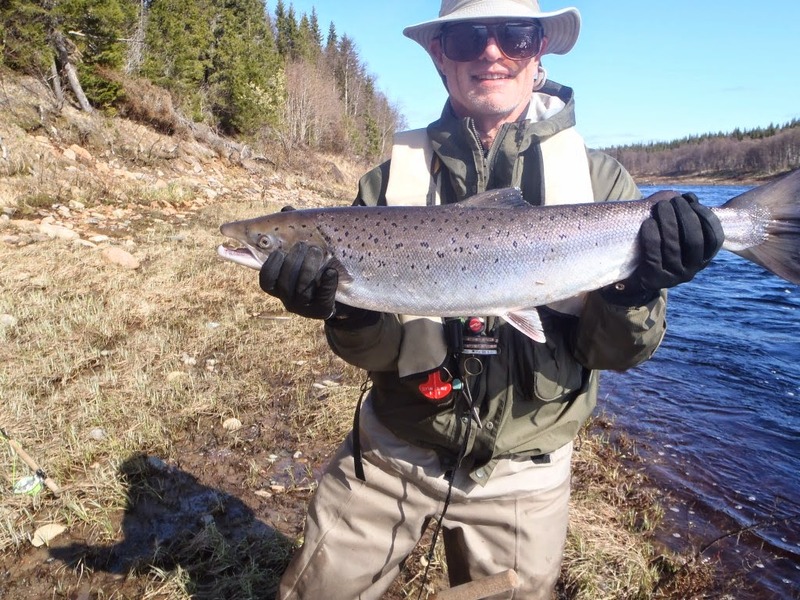 None of the pools above Clarkes are really working yet which is yet another indication that the fish are being held up there before they start their major run up the river. 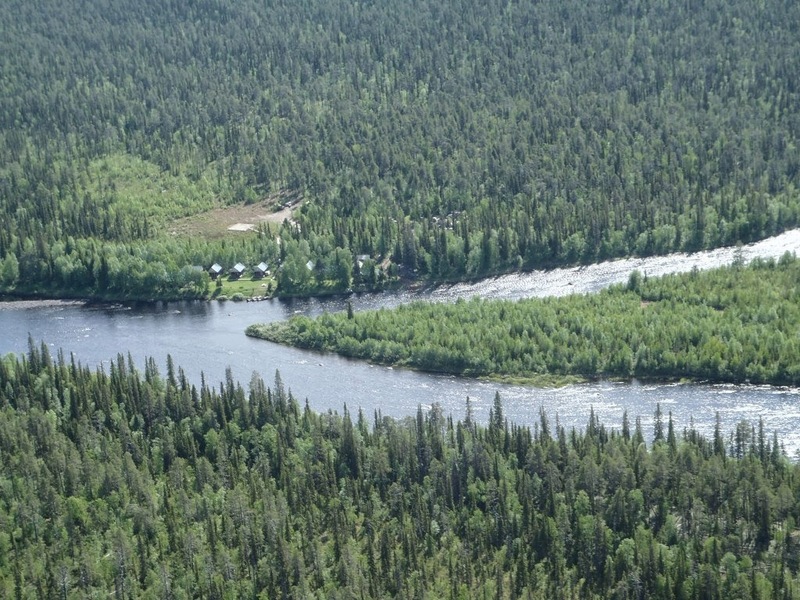 As a result I am afraid that Pana remains very slow but this late spring does allow us the chance to add another week of fishing at this legendary camp. 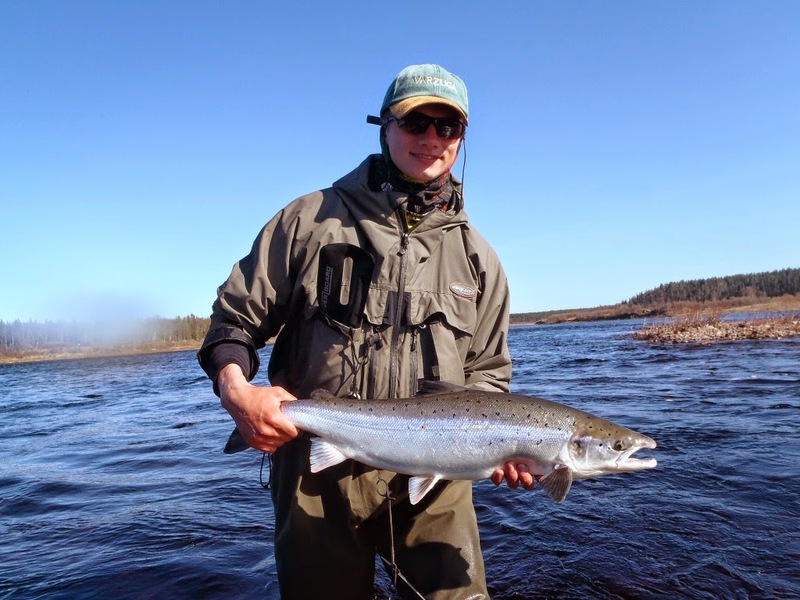 Pana is 80 miles from the White sea and it takes time for the fish to get there in big numbers – we would expect the week to average between 30-40 fish per rod but on similar dates in 2009, 8 rods averaged 63 fish per rod so it can be extremely productive in conditions such as these. We will keep the camp open this year for a fifth week, Saturday 21st to Saturday 28th June for a maximum of 8 rods – there is a minimum requirement of 5 rods for the week to run. The camp will be staffed by our own Roxtons manager and cook plus the regular Russian team. The cost is £3,800 per rod, including all drinks in camp. 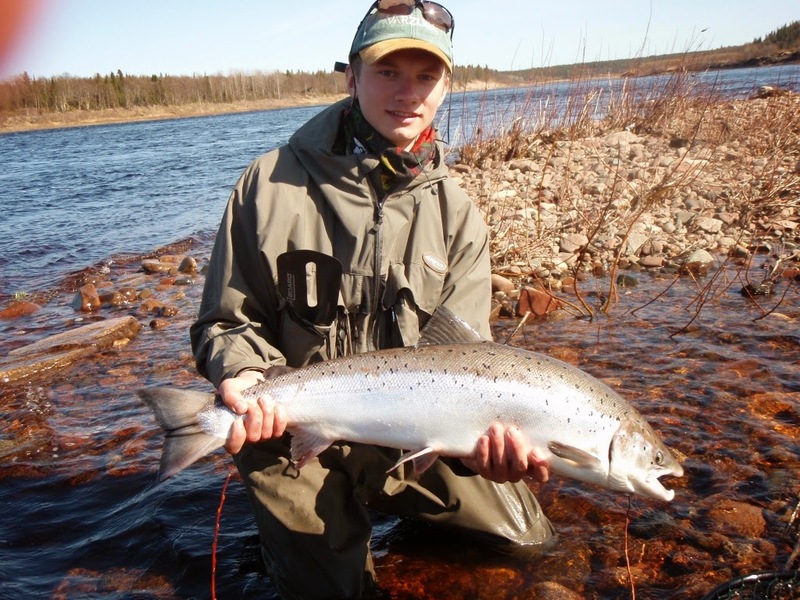 Flights to and from Murmansk and visa costs are not included. This opportunity is very much first come first served and please contact the office as soon as possible if you would like fish Pana this year. Just to add to the feeling of a late spring, it is snowing here this morning and I suspect we will be having lunch back in the dining room again but if it means the same sort of numbers as we had yesterday then no one will be complaining. All of the 4 camps that we run on the river are linked by HF radio, the advantage of which is that it is an open radio meaning that we can all hear one another which is useful in many different ways. Sometimes the radio reception can be patchy and in emergencies or when we really need to clarify something, we have satellite phones. After radio call last night I asked Terry to call me on the sat phone as I was not sure I had deciphered his numbers properly. The 12 rods at Middle Varzuga landed 262 fish on top of a further 111 they’d had on their first evening – simply extraordinary fishing and figures I felt were worth double checking. Rather inevitably, there were some huge scores to individual rods and I shall just give a few highlights; the father and son team of David and Stephen C landed 52 between them, Jeremy H, Paul C and Lawrence R all had 30 each and one regular guest landed 38 in the day. That the fish are being held up at Middle is good news for them but means that the team at Pana have to wait a bit longer than normal for the run to get to them. They will but sadly they had not by yesterday and it was a quiet day up there. We are lucky to have our Spanish friends in camp who had a bonanza in the low water of last year and know that this can be the way it goes. Kitza, perhaps predictably, completely altered on changeover day and the 10 rods had a great day landing 45 fish. With new showers fitted on Saturday and plentiful fish across the beat, it does feel like a different camp – all in the space of 2 days. 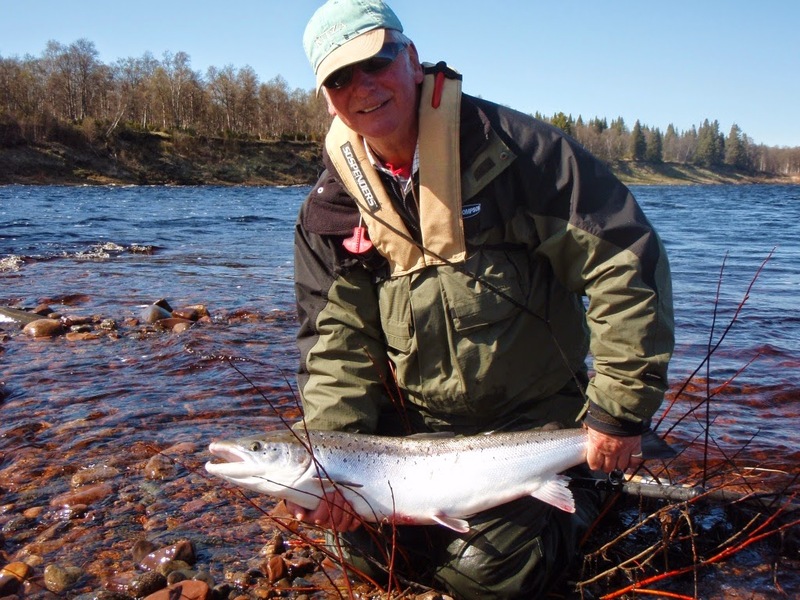 Peter H was the top rod with 10 for his day and Bruce B had a really chunky fish of around 13lbs from Deluxe. 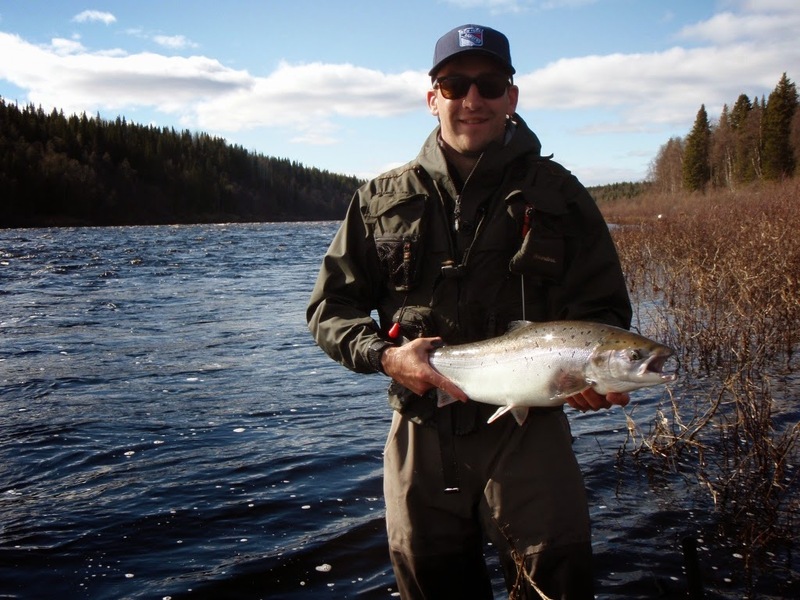 Brendan G went out this morning and has already landed 3 from the Heli pool so their day looks set fair. At Lower we had a really good day and finished with 49 in the book. Tudor D just outfished his son Rhodri and they had 8 and 7 fish respectively with other son Will, close behind on 5. 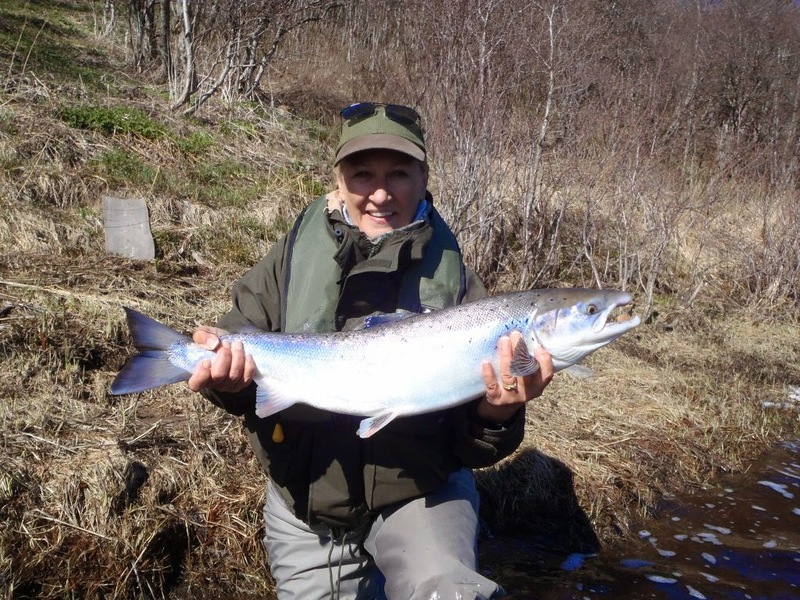 Michael S-D and fishing partner Bob M matched each other with 7 fish each but the day’s biggest celebration was reserved for Valerie J who landed her first salmon on a fly. It was not exactly a small one either and the many shots of vodka that were consumed last night may explain a slightly weary start this morning. More tomorrow when hopefully I will have some pictures of Middle Varzuga as I am planning on going up there this evening.